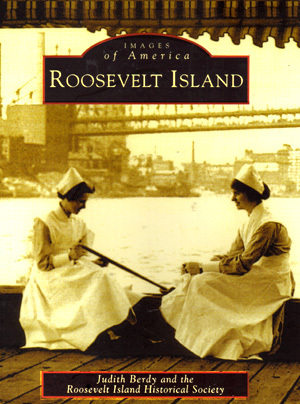 Roosevelt Island -- formerly Welfare Island and Blackwell's Island -- is the focus of a fall 2003 Images in America book from Arcadia. The series features archival photos of communities and institutions having historical interest. 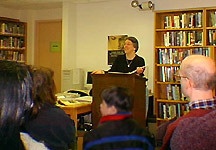 The book's author is Judith Berdy shown above at the Roosevelt Island library. A writer, researcher, and lecturer, she has been a resident of Roosevelt Island for 25 years and is the president of the Roosevelt Island Historical Society. She contributes to the Wire, the island's community newspaper, and gives historical tours and lectures for the society. The New York Correction History Society appreciates the permission granted by Judith Berdy and the Roosevelt Island Historical Society to present these text and image excerpts from their copyrighted book Images of America: Roosevelt Island. © They reserve and retain all their rights thereunder. The book covers the many major institutions in the island's extensive history -- including almhouses, asylums, research laboratories, hospitals, houses of worship and nursing school -- as well as current facilites. This NYCHS excerpts presentation focuses on two institutions long gone: the penitentiary and workhouse.
. . . In 1633, Wouter Van Twiller was appointed the Dutch governor and soon persuaded the Native Americans to sell him large tracks of land. One was the 128-acre, two-mile-long island just east of Manhattan. . .A convenient location to raise hogs for their tables, this place became known as Varckens (Hogs Island).. . . .
King Charles II in 1664 gave his brother James, who later became King James 11, Long Island and its neighboring islands. He, in turn, awarded Capt. John Manning, who was sheriff of New York, Varckens Island for loyalty to the Crown. The island became known as Manning's Island. . . .
Blackwell's Island Penitentiary is shown under construction in the above archival photo from the Roosevelt Island Historical Society's Oliver Chapin Collection, one of the 150 photos and illustrations in Images of America: Roosevelt Island©. When he died in 1685, the island was inherited by his stepdaughter, Mary Manningharn, wife of Robert Blackwell. Thus, the island became Blackwell's Island, a name that would remain until 1921. . . . In 1828, the governor of New York, Philip Hone, was impressed by the quality of the building stone on Blackwell's Island. He proposed that a penitentiary be constructed on the island. The Blackwell family had finally found a buyer. The city of New York paid the princely sum of $32,000 for the land. Blackwell's Island was the first of many small islands purchased by the city to address social problems created in part by an exploding population and lack of any governmental agencies to deal effectively with such problems. The city leaders insisted that institutions, located on quiet islands, would be places where the sick would be cared for in a healthful environment and the criminal would have an ordered place to reconsider his or her actions. As the most prosperous city in the nation at the time, the city hired the century's top architects to design the charitable and corrective institutions. The cornerstone for a prison was laid in September 1828. The facility opened in 1832, and its vast wings ran north to south in the center of the island. care and supervision for the patients. . . .
Blackwell's Island Penitentiary is depeicted in the above 1839 illustration from the Roosevelt Island Historical Society's archives, one of the 150 photos and illustrations in Images of America: Roosevelt Island©. Penitentiary Hospital, which treated patients with venereal diseases, opened in 1849. . . . The workhouse, built as a minimum-security prison, opened 1850. There, inmates served short sentences for petty crimes such as prostitution and drunkenness.. . . In 1796, New York State built its first penitentiary in Greenwich Village, only a mile and a half north of city hall. The state prison was popularly known as "Newgate" after Great Britain's prison of the same name. Although they shared a label, the American Newgate was referred to as a penitentiary rather than a prison. This reflected a difference in concepts as to the purpose of incarceration. Social reformers, mainly members of the Quaker Society of Friends, led the movement to make the criminal justice system more humane, believing that each person had an "inner light" and could be redeemed if they recognized their sins and did penitence. The vastness of the Blackwell's Island Penitentiary complex is shown in another photo from the Roosevelt Island Historical Society's archives, one of 150 photos and illustrations in Images of America: Roosevelt Island©. The Greenwich Village Newgate closed after 27 years, and the prisoners moved upstate to the newly constructed Sing Sing. The City ofNew York had separate city institutions, including a penitentiary at Bellevue on the shores of the East River. They planned to buy Newgate but instead purchased Blackwell's Island as a more promising site for the facility. This location moved the penitentiary and charitable institutions a comfortable distance from Manhattan. Prisoners from Bellevue were immediately sent to the island to grade the land, build a seawall around the island, and start construction on the new penitentiary. It was a very large structure, 600 feet long and four stories high. Shaped as an L, it consisted of three structures, a short wing on the north side joined at a right angle to the administration building and the longer cellblock wing. The penitentiary faced Manhattan parallel to the East River on the site now occupied by the Goldwater Campus of Coler-Goldwater Speciality Hospital and Nursing Facility. The first institution built on Blackwell's Island, it was constructed of granite blocks from a nearby quarry and, in appearance, resembled an austere medieval castle. 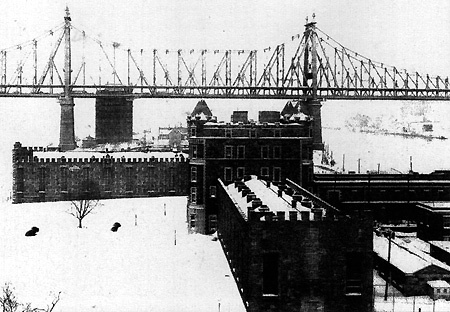 Blackwell's Island Penitentiary, wearing winter snow and with the Queensboro Bridge in the background, is shown in the above photo from the Roosevelt Island Historical Society's archives, one of 150 photos and illustrations in Images of America: Roosevelt Island©. Designed with 800 cells for the prisoners, it was often overcrowded. All prisoners were required to work. The stronger labored at the quarry or constructed additional institutions on Blackwell's Island, as well as other islands. Other male prisoners worked in the various penitentiary workshops, and the incarcerated women cooked, sewed, cleaned, and acted as nurses to the other convicts. It was truly an appropriate place to do penitence. In 1852, the Blackwell's Island Workhouse was built to replace the 100-year-old workhouse located at the Bellevue site. This facility functioned as a house of correction for those convicted of minor offenses. Known as "drunks and disorderlies," these convicts served short sentences and were assigned duties similar to those of the penitentiary inmates. In 1894, W.L. Strong was elected mayor of New York City with support from social reformers. Until that time, one huge agency oversaw all charitable institutions and prisons. Mayor Strong believed that forming separate agencies to administer the charitable and correctional institutions would improve management. The Blackwell's Island Workhouse is shown in the above postcard photo from the Roosevelt Island Historical Society's archives, one of 150 photos and illustrations in Images of America: Roosevelt Island©. In a message to the Common Council, he noted that there were three times the number of people in the workhouses, almshouses, hospitals, and prison than were originally planned for: The condition of our City Prisons, to speak broadly, is execrable, and the accommodations in the Almshouse and Workhouse insufficient, inadequate and incomprehensible, while overcrowding is a startling characteristic of the penitentiary. His restructuring marginally benefited the charitable institutions, but it had little impact on the Blackwell's Island Penitentiary. In 1921, as part of its reform effort, the city council decided to improve the island's image by changing the name to Welfare Island. Reports of inmate overcrowding, drug dealing, and favoritism continued to fill the popular press but were not addressed by the city. In 1933, reformer Fiorello LaGuardia was elected mayor. One his first acts was to appoint Austin H. MacCorrnick as correction commissioner. In January 1934, MacCormick and his men raided the penitentiary on Welfare Island. The place was run by two highly organized gangs, each with its own boss. These racketeers lived comfortably, enjoying many amenities while the majority of prisoners existed in miserable conditions. The bosses and 66 gang members were put into solitary confinement, and the warden of the penitentiary was suspended from his duties. In a short time, all remaining inmates were removed to the recently completed prison on Rikers Island. Mayor LaGuardia, considered by some to be the greatest of New York City's mayors, had clearly demonstrated his intentions to clean up the city. 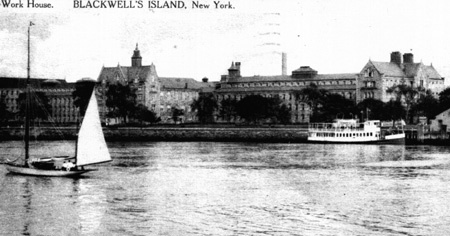 In 1936, the Blackwell's Island Penitentiary was razed. . . .
. . . In the late 1800s, the city entertained a proposal to raze the buildings and create a lavish public park. No action was taken at the time, but in 1936, parks commissioner Robert Moses again raised the idea. However, Sigmund S. Goldwater, the commissioner of hospitals, supported locating a hospital park consisting of seven moderm hospitals and support facilities for the chronically ill.
Goldwater won the battle, and in 1939, a fine nurses' residence was completed. A year later, Chronic Disease Hospital, which was renamed in 1942 for the late Sigmund S. Goldwater, opened its doors. Goldwater Hospital was built on the site of the demolished Blackwell's Island Penitentiary. It covers a 10-acre site and consists of seven connected chevron-shaped buildings that face Manhattan. . . .